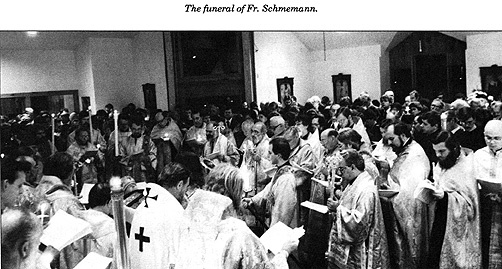 Following Fr Alexander Schmemanns death on December 13, his body was brought to the Chapel of the Three Hierarchs at St Vladimirs Seminary the same evening. On December 14 several memorial services were celebrated by visiting clergy, including particularly His Eminence, Archbishop lakovos, who was accompanied by Metropolitan Silas and Bishop Methodios; His Eminence, Metropolitan Philip of the Antiochian Archdiocese, with numerous priests; and by His Grace, Bishop Nicholas of Amissos (Ukrainian Church under Constantinople). At 7:00 P.M. a solemn memorial service was celebrated by His Beatitude, Metropolitan Theodosius, with numerous priests and friends present, with Fr John Meyendorff giving a homily. On December 15 at 7:00 P.M. the full service for the burial of priests took place at the Chapel, presided over by Metropolitan Theodosius in concelebration with twelve bishops and over a hundred priests. The concelebrating bishops were Metropolitan Vladimir (formerly of Japan), Bishops Maximos of Pittsburgh (Ecumenical Patriarchate), Kyrill of Pittsburgh, Peter of New York, Christopher of Eastern States (Serbian Church), Herman of Philadelphia, Gregory of Alaska, Mark of Boston, Boris of Chicago, Job of Hartford, Antoun of Selefkia (Patriarchate of Antioch), and Basil of San Francisco. The main homily was delivered by His Eminence, Metropolitan Philip of the Antiochian Archdiocese of North America, Professor Veselin Kesich made an address on behalf of St Vladimirs Seminary Faculty. On December 16, in the morning, His Beatitude, Metropolitan Theodosius, celebrated the Divine Liturgy together with Frs Meyendorff, Hopko, Lazor, Allen, Tarazi and Tkachuk. Fr Hopko preached after the Gospel and the Metropolitan himself delivered a homily at the end of the service, before Fr Alexanders body was carried around the church and then driven to St Tikhons Monastery Cemetery for interment. In addition to clergy from practically all Orthodox jurisdictions taking part in the funeral services, a number of churches and institutions sent representatives including The Holy Cross Greek Orthodox School of Theology, Hellenic College (President Lelon, Dean Calivas, several faculty and students), St Sergius Theological Institute, Paris (Professor Andronnikov), the Coptic Orthodox Church (Fr Gabriel Abdel Sayed), the Armenian Apostolic Church (Frs Aivazian and Kasperian), the National Council of Churches (Mr. Andrew Vance), the Cathedral of St John the Divine (Dean Morton, Canon West), Iona College (Brothers Offer and Quinn), Union Theological Seminary (Dr William B. Kennedy), General Theological Seminary (Professor Talley); also present were Rev N. Neuhaus, representing the Lutheran Church, Bishop Ressmeyer, Msgr Eugene Clark (Pastor, Annunciation Roman Catholic Church, Crestwood), and Msgr Daniel Hamilton (Editor, Long Island Catholic). Among the very numerous messages of sympathy received by the Seminary were those of Patriarch German of Serbia; Archbishop Seraphim of Athens and All Greece, Metropolitan Philaret of Minsk (on behalf of Patriarch Pimen of Russia), Metropolitan Anthony of Leningrad, Metropolitan Theodosius of Tokyo, Archbishop Paul of Finland, Metropolitan John of Helsinki, Archbishop Georges (Paris), Archbishop VaIerian and Bishop Nathaniel (Detroit), Bishop Nicholas (Tokyo), Cardinal Willebrands (Vatican Secretariat of Unity), Archbishop Torkom Manoogian, Archbishop Mesrob Ashjan and Bishop Avek Asadourian (Armenian Church), Professor Todor Sabev (Acting General Secretary, WCC). Orthodox theological schools throughout the world sent messages, including the Theological Schools of Athens, Thessalonike, Belgrade, Moscow, Leningrad, Paris, Kodiak (St Hermans) and South Canaan (St Tikhons), as well as the Orthodox Theological Society of America, Columbia University, Concordia College (Bronxville), Immaculate Conception Seminary (Rahway, N.J.), Theological Faculty of Loyola, St Joseph Seminary (Yonkers, N.Y.), the American Association of Theological Schools and many others. 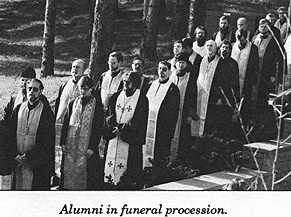 The feast of the Three Holy Hierarchs, the patronal feast of St Vladimirs Seminary Chapel, was the occasion for an Academic Convocation, held at the Seminary on January 30, 1984. Guest speaker for the evening lecture was Fr Boris Bobrinskoy, Professor of Dogmatic Theology at St Sergius Institute in Paris. The celebration of the patronal feast began with Vigil and the Hierarchical Divine Liturgy, presided by His Beatitude Metropolitan Theodosius who concelebrated with Fr Bobrinskoy and the Seminary clergy. 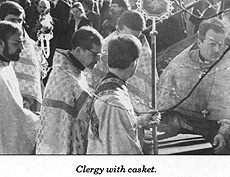 Ordained to the diaconate during the Liturgy was Joseph Gillis, a 1983 graduate of the Seminary. The evenings festivities began with a formal dinner hosted by the Faculty of St Vladimirs Seminary for guests from other Orthodox theological schools and representatives of St Vladimirs Alumni Association. Vespers in the Three Hierarchs Chapel inaugurated the formal program. At the conclusion of the Vespers service, Fr Anthony Scott, president of the Alumni Association presented to Matushka Schmemann, a certificate of recognition given posthumously to Fr Alexander Schmemann in gratitude for the gift of his long service to the Seminary. Mrs Schmemann then addressed the congregation, thanking the members of the Seminary Family in very personal terms for the love and support which was extended to Fr Alexander and to the members of his family throughout his illness and following his death. A lovely photo of Fr Alexander and his wife on the Seminary grounds was then presented to Mrs Schmemann as a token of thanks for enabling her husband to give so much of his time and effort to the Church, to the Seminary, and to so many individuals during his lifetime. The formal program, held in the Chapel Auditorium, was opened by Metropolitan Theodosius who announced that this annual series of lectures would be held in honor of Fr Schmemann, former Dean of St Vladimirs Seminary. Professor Veselin Kesich, Acting Dean of St Vladimirs welcomed the guests in attendance, saying "in simple Serbian terms" that "we are celebrating today the Slava of our Chapel." Noting the fact that the guest speaker was from St Sergius Institute of Paris, he referred to the deep connection of St Vladimirs Seminary with St Sergius Institute, St Sergius having provided this school in America with several distinguished faculty members: Fr Georges Florovsky, Professor George Fedotov, Fr Alexander Schmemann, Professor Serge Verhovskoy, and Fr John Meyendorff. Through them, he said, we learned that spirituality and theology must go together; they refused to exchange spirituality for certain abstractions in theology. Professor Kesich then introduced Fr Bobrinskoy who addressed the gathering on the theme of "The Indwelling (or Resting) of the Spirit in Christ according to the Cappadocian Fathers." Fr Bobrinskoy addressed the problem resulting from Scholastic theology of the diminished role of the Spirit in Christology. He stated that the organic link of pneumatology (the theology of the Holy Spirit) and Christology has been lost or ignored. He then devoted his remarks to the work of the Cappadocian Fathers: Basil the Great, Gregory the Theologian (Nazianzen), and Gregory of Nyssa, whose theology was based on the interrelationship of the Spirit and the Word. He spoke of the Spirit "anointing" Christ the Word and permeating His Life, of the Spirit being like the "breath" without which the word cannot be communicated. Drawing on the works of St Basil the Great, he described the dual function of the Spirit as acting and as creating a milieu, and referred to the example of St Basil: "the Spirit is truly the place of the saints, and the saint is the place of the Spirit." At the conclusion of his address, Fr Boris added references to the work of St John Chrysostom on the Holy Spirit. His address appears in this issue of St Vladimirs Theological Quarterly.